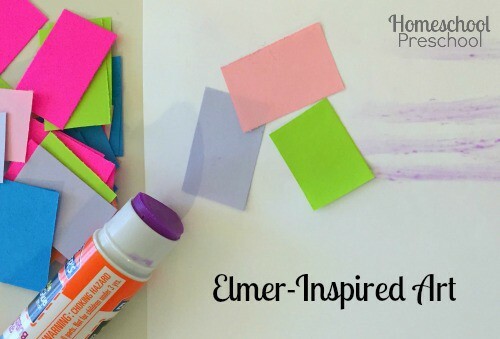 Next up in my ‘teaching with picture books’ series is a colorful book called Elmer. It’s about a friendly elephant who discovers why it’s best to be unique. He discovers that life can be a little boring when everyone is the same. 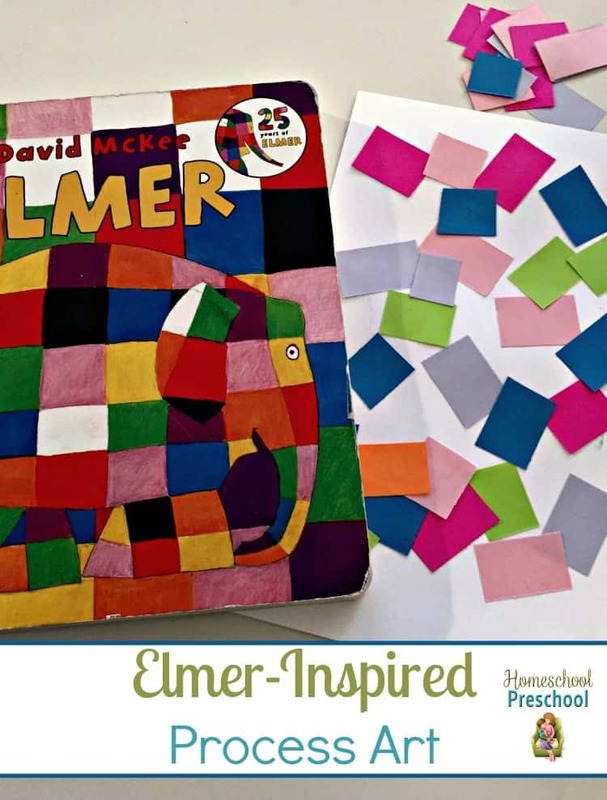 Elmer the elephant is bright-colored patchwork all over. No wonder the other elephants laugh at him! If he were ordinary elephant color, the others might stop laughing. That would make Elmer feel better, wouldn’t it? Can Elmer figure out what makes him special? Elmer is a pretty colorful fellow. 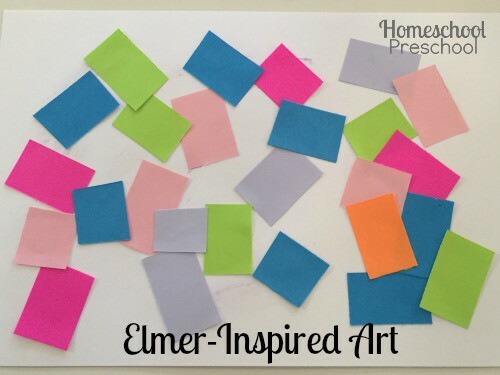 Like Elmer, your child’s patchwork art will be one-of-a-kind. All you need is a pair of scissors or a paper cutter, glue, colored paper cut into 1″ squares, and a base sheet of paper. You can use many different types of paper for this project. Our project is made with white cardstock and colored typing paper. You can use cardstock, construction paper, tissue paper, or scraps of construction paper. Use what you have on hand. Cut your colored paper into 1″ squares. If you want your child to work on their motor skills, you can cut your paper into strips let them cut the strips into squares. Or, you can do all the cutting for them. Choose your base paper. Cardstock or thick construction paper will work best. Thicker paper won’t wrinkle as much once the glue is on it. It’s up to you whether you want to use white glue or a glue stick. I prefer glue sticks, because they are less messy. But, the white glue is easier to pour on the page and spread without worrying that it’ll dry before the project is complete. Use what works best for your kids. Let them place the squares on the base page randomly. That is what will make this project a unique, one-of-a-kind masterpieces. After they are finished with the project and all of the glue has dried, your kids may enjoy cutting their finished products into 1.5″ strips to use as bookmarks. Or, they may want to display it as is. 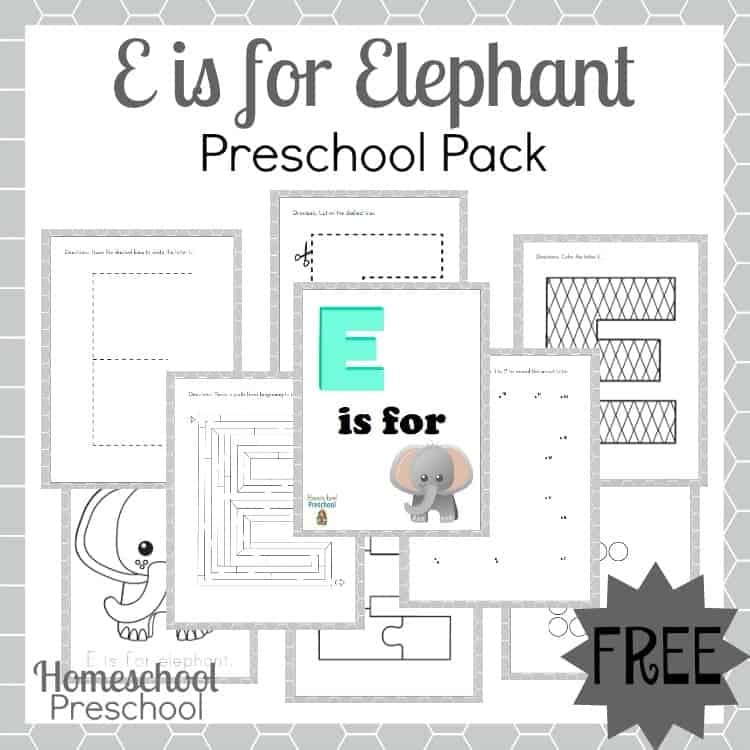 Inside this free “E is for Elephant” pack, you will find a maze, dot-to-dot, tracing pages, coloring pages, and more. To download your free printable pack, you must sign up to receive my emails. Enter your contact information below. Then, check your inbox. Enjoy!